You know that you have a bright kid. But every single time that report card comes at the end of the semester, you keep seeing C’s and D’s marked all across the page. On top of that, you get calls from the school reporting your child’s inappropriate comments in class and how they’re receiving a warning. Do you feel lost and helpless? Do you fear that your child’s lack of organization skills and focus abilities will ruin his/her future? This is an issue that many, many parents struggle with on a day-to-day basis. Products like MRM Attention Gels are made so that your kids can keep their cool and finish their homework without having mood swings and anxiety. MRM Attention promises to improve focus, learning and behavior while ensuring that your child receives the necessary nutrients for proper growth. Are they all talk? Or will this supplement be the next rave around the office? MRM or Metabolic Response Modifiers is a healthcare company based in the U.S. that aims to create supplements through clinical research and application. Their product line is not limited to MRM Attention Gels alone, but actually includes immune boosting and fitness-oriented supplements. Their team consists of members that are passionate about the business as well as helping people around the world improve their quality of life. Here at BEA, we share the same type of passion and dedication, which is why we respect MRM’s efforts of producing good quality supplements. Moving quickly through the first section of the list, we have some vitamins and minerals that would benefit your child’s general health. These are good ingredients but they belong to a category that we like to call “fillers”. There’s no need to combine a cognitive boosting formula with a multi-vitamin. We’re sure that you already have a multi-vit ready for your child or wouldn’t mind getting a separate, but more complete vitamin supplement to ensure good health. Besides that, we’re actually quite happy with what we’re seeing here. MRM Attention contains DMAE, Choline Bitartrate, and inositol. DMAE is quite potent and should help your child experience better focus and memory. There have been reports on the supplement causing side effects, however, which is why it is crucial that you stay within the recommended dose. Choline Bitartrate is, well, just okay. Choline in itself is an excellent brain-boosting ingredient. The form that choline is in, however, plays a role in its effectiveness and how well our bodies can absorb it. Choline Bitartrate works just fine, but its benefits are typically not as recognized as that of CDP Choline or Alpha GPC. 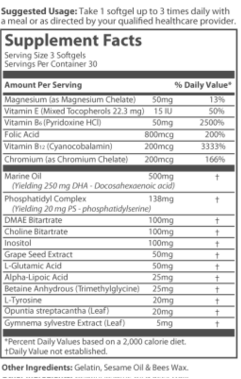 The reason why a lot of supplement companies choose Choline Bitartrate over the other, better quality options, is because it is sold for a lot cheaper. Inositol is an ingredient that you will see a lot of when looking through kids’ supplements. It works by improving mood and reducing anxiety, which can help children with attention issues and ADHD focus better. “I love this stuff it works for my daughter and I. She doen’t like the smell or taste and you must take on a full stomach. I always try everything I give my kids and this made me accomplish so much. I only had to take one and the suggested is three a day. I could feel it wear off and it was at a perfect time near bed. I wish they came in gummies or liquid. My daughter is so much more alert and happy and glows when she is on this. Its all natural and MRM is a great company.” – crystallisms on Amazon.com. “Speaking with my son’s psychiatrist and experiencing this with my son, there are those who need a stimulant to be affected by any kind of medication or supplement. Unfortunately, my son is one of those people so these do not particularly work for him. i did take one myself, as they are supplements everyone should take anyway, and they definitely helped me focus more, but I don’t have ADHD. So for the normal person or the kid with ADHD who reacts to non-stimulant medication, this will probably work well. A person who is accustomed to adderall or vyvanse, this may not seem like anything at all” – Nicole S on Amazon.com. “These had an ungodly scent that smelled spoiled and decomposing, even though the date on the bottle was in date. I couldn’t stomach even getting them to my mouth. Will never buy these again. Wasted money. :(” – susan s on Amazon.com. Two different online websites that you can get MRM Attention Gels from – the first one is Amazon.com, where a 90-count bottle is sold for $14.72. The second and more reliable option is MRM-USA.com (the official website), where the same 90-count bottle is sold for $29.95. Of course the first one sounds for economically appealing but you are more likely to make a secured purchase when ordering from the official website. MRM Attention Gels, just like a lot of other products out there, is made to help your kid keep calm and get more focused. If the product works for you, then you’ll be seeing an end to the war between parent and child, leading to much brighter and more positive days for the both of you. If the product doesn’t work for your child then you would’ve wasted nearly $30. Based on the consumer reviews posted on Amazon.com, we have seen that there’s an equal amount of parents who praise and knock down the product. Our final suggestion? Go with an option like Lumonol Prep, which has a much more solid formula and offers a 100% no questions asked money-back guarantee.